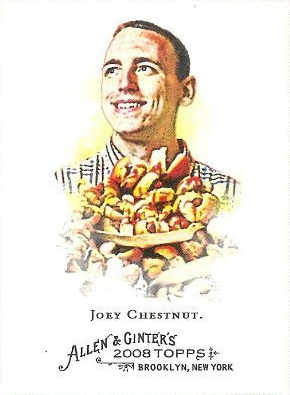 What better way to celebrate America than with a 2008 Topps Allen and Ginter # 109 Joey Chestnut (Hot Dog Eating Champion) MLB Baseball Card ? Keep it in your wallet so you remember how many hot dogs you’ll have to eat to break the record! In the 2012 contest, Chestnut won his sixth consecutive title by consuming a record-tying 68 hot dogs and buns (HDBs) in ten minutes. Yikes. Hmm, maybe you’re better off not trying to pretend like your backyard BBQ is the Nathan’s Hot Dog Eating Contest. In fact, I’m sure you are!